Only the charisma-free, 74-year-old, Brooklyn-born Jewish socialist from Vermont could bring the political revolution this far. This is what a mensch looks like. Al Franken couldn’t do it. Elizabeth Warren couldn’t do it. Cory Booker didn’t even come close to doing it. Even Sarah Silverman, may her light ever shine, couldn’t quite do it. Only Bernie Sanders, a charisma-free 74-year-old Brooklyn-born Jewish socialist from Vermont, could have gotten the political revolution close enough to take off to change the national conversation, expand the boundaries of political possibility far over to the left, and demonstrate conclusively the immense power of Americans united against the gilt facade of Citizens United. Only Bernie Sanders had the power, and the wisdom, not to walk out but instead to deal himself and his supporters in to negotiate the most progressive platform in the history of the Democratic Party. And having gotten so close—heartbreakingly close. Close enough that many of his own supporters booed him just a few hours ago for daring to point out the F**king Obvious fact that the stakes for themselves, their children, and their country were simply too high to stay home and sulk—only Bernie Sanders could have landed that plane carefully, even delicately, on prime time, with both wings intact and more or less right on schedule. Not without some turbulence, to be sure. 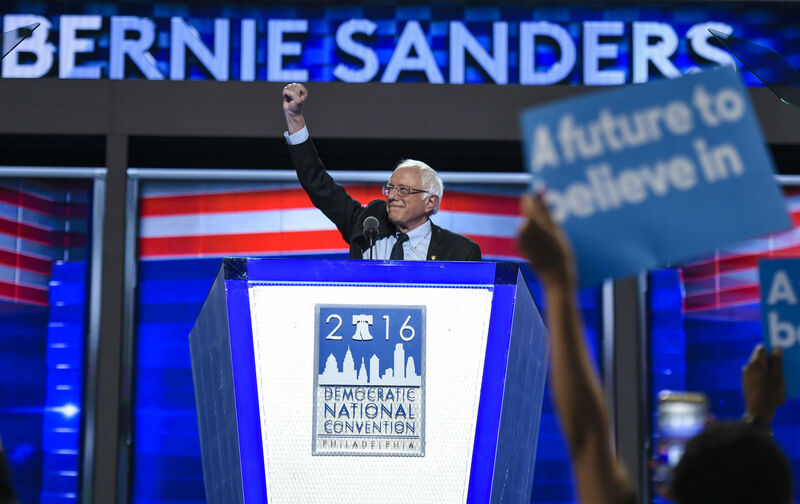 Though the leaked DNC e-mails only confirmed what Sanders and his supporters had known all along, the timing of the leak ensured that feelings would be high in Philadelphia. Debbie Wasserman Schultz’s resignation helped a little. Her total banishing from the convention helped more (and if she comes back to gavel out the proceedings on Thursday night, I hope somebody throws a bucket of water on her). I’d have said they were heartbroken, but Silverman had a point. Anyone who can’t see that what Donald Trump and Mike Pence would do in government—not just to the Supreme Court, but to the Constitution and the Bill of Rights—represents a clear and present danger far greater than the inevitable disappointments of a Clinton presidency needs to grow up. Or check your privilege. Because the people who really need the government—for protection, for treatment, for education, for shelter—are counting on us to get over ourselves. Just as the Democratic primary season was never going to be a fair fight, bringing the party together was never going to be easy. Bernie had to bring his people along slowly—though when I spoke to Dottie Deans, chair of the Vermont delegation, she said her state, which Sanders carried by a huuuge margin, was ready for unity. My own view is that Sanders might not have made it without Michelle Obama. Before she came on, I thought the best speech of the night was given by a man who has actually been dead for over a year. But not even Mario Cuomo outshone Obama. In the quiet tones of a woman in her own kitchen, the first lady reminded the convention how far this country had come: “I wake up every morning in a house that was built by slaves.” When she reached the line about watching her daughters, “two beautiful and intelligent young black women,” playing on that White House lawn with their dogs, a lot of us were crying. And while other speakers praised Clinton and were booed for it, no one dared disrupt Michelle Obama. Her soaring message made an odd lead-in for Elizabeth Warren—the first speaker of the night to acknowledge how much remains to be done (and, implicitly but unmistakably, how much the Obama administration has left undone). Warren was lethal on Trump, but otherwise pedestrian; those who think she’d have won the nomination in a walk got no help tonight. But what she did perfectly was to set the stage for Sanders, who after a brief medley of his campaign speeches—including, to my great delight, the call-and-response for $27—gave it to us straight: “If you think you can sit it out, take a minute to think about the Supreme Court justices Donald Trump would appoint—and what that would mean to civil rights and civil liberties.” Sanders made it clear he was taking this election personally—and would continue to strain every sinew to put his former opponent in the White House. Because, as Bernie has always told us, this isn’t about him. Because he’s a grownup—and he knows what’s at stake. It can’t have been easy—especially after those (new) damned e-mails. I just hope Hillary is grateful. Hell, if she wins I hope they erect a huge statute of Bernie on the Mall. Pointing his finger. Paid for by public subscription. At an average donation of… $27.